I AM A WATER PROTECTOR! My name is Maria Rose, I am named after my grandmother Mary, who was a victim of genocide where my father was the only survivor & My grandmother’s sister, Rose, the second woman left from our lineage, adopted him after the family killings. I come from the DENE nation, in the Northwest Territories of Northern Canada. I am an advocate for protecting mother earth. I run earth-skills camps, Nature-Mentoring, and aim to preserve the ways of nature, the ways of my ancestors. I did many things at STANDING ROCK. Standing in prayer was my main focus. Each step I kiss our Mother Earth. At times took care of the woman sweatlodge fire. I brought food and water to the elders and did many momentary prayers every day. I was there for a month, until… I got sick. Sick from the rat poison they were spraying from airplanes. So, my friend Gilles (Who I accompanied at times while he was using his Swiss Army Truck to get people unstuck — took me to the Casino Hotel for two nights in deep December. (Like many did, we welcomed people to take showers in the room that we shared). On the second morning, we were sitting with two reporters named John. Gilles left for the room and an older woman came to sit with us. Amazingly, she was also Dene and knew my father. By chance, she was going back to North West Territories and took me home for the first time in my life! I got to meet my distant families, my tribe, my Northern home. I lived there for 6 months. During that time, I return to Standing Rock, with others, to help bring an entire WILD BUFFALO, that we hunted together with the Nez Perce tribal members in the treaty lands of beautiful Yellowstone. Gilles and I were the only ones who were present in the hunt. I saw her get shot, I looked her in the eyes, I prayed, I gave thanks, I honored her life-giving force, to the well-respected water protectors. We processed her, she was huge. We skinned her carefully, with head skin still attached. 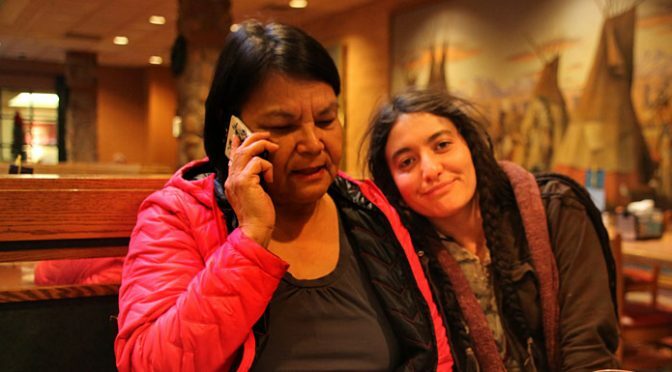 We honored her, every moment and brought her to Standing Rock — to Water Protectors. Buffalos’ face the storm, they always walk forward. We wanted to gift that spirit to the water protectors, the elders, those who remained to stand, even though the eviction was put in place. We drove not knowing if we were going to be able to get in… In fact, we were some of the last ones allowed in. We gifted two brain-tanned buffalo robes to two well respected front-line water protectors, tanned by respected Buffalo Bridge crew. We gifted many jars of meat that were processed during Buffalo Bridge and gifted fresh meat to the many kitchens. It was one of the biggest gifts of my life, to see Grandmothers cry holding Wild Buffalo organs, something they haven’t had since childhood. I knew from those moments onward, the rejuvenation of the next seventh generations was happening. Honoring elders, and all beings. We left two days before the evacuation, driving all the way back to the Nez Perce reservation for more ceremonies. When I finally returned home… Two weeks later, the Southern pipe arrived. It is written, the rejuvenation of the next seventh generations is to happen when the pipe arrives North… just by chance, I was graced with being at the ceremony. I knew, even though I wasn’t on the front lines, I was still there. I’m amazed at the strength of all those who went to the front lines. Yet, I was on the prayer lines, with everyone else at Standing Rock. Walking in prayer, witnessing the rising and reclaiming every day; Our home. Our rights. Our sovereignty. I was accepted on the Youth Advisory Board of Canada, to protect water and help raise awareness in communities, to stand up for our, water. WATER IS LIFE!